Are Low-Carb Diets Safe for Kids? If you haven’t already tried some sort of modified-carb diet, you’re probably thinking about it. And if you have reduced carbs and found it effective, you may be tempted to put your spouse on a similar program—or maybe even your kids. Whether it’s because your children could stand to lose a couple of pounds, or you simply don’t want to cook different meals for each family member, getting the whole group on a low-carb diet may sound inviting. Considering that restaurant menus, fast-food chains and grocery-store shelves are now overflowing with reduced-carbohydrate options, carb-cutting appears to be an all-ages show. Appearances, though, can be deceiving. While most kids (like most adults) could stand to lighten up on unhealthy, carb-heavy processed goods like soda, white bread and candy, restricting a growing child’s intake of healthy carbohydrates can result in problems down the road, even if he or she is currently overweight. Despite the low-carb craze, carbohydrates aren’t nutritional villains, nor are they all created equal. Whole-food carbs, including fruits, vegetables, legumes and unrefined grains, are a critical source of nutrients, such as vitamins, minerals, antioxidants and phytochemicals. Carbohydrates are also the main dietary source of energy, and their ingestion affects many aspects of brain and bodily function. Carbohydrates are divided into two groups: complex carbs and simple carbs. Complex carbohydrates take longer to digest and are usually packed with fiber, vitamins and minerals. Examples include whole-grain varieties of bread, rice and pasta; vegetables such as beets, broccoli and carrots; and legumes, such as lentils, peas and beans. Simple carbohydrates, also called simple sugars, are digested quickly and can contain refined sugar, fructose (fruit sugar) or lactose (milk sugar). Candy, cakes, sodas and syrups are all good examples of simple carbs. High-sugar fruits, such as bananas and oranges, also are rich sources of simple carbs. Then there are refined carbs, which are considered a subcategory of carbohydrates because they are not “natural” carbs. These are similar to simple carbs in that they have the same effect in the body as sugars. They are primarily starches that have had the bran, hull, fiber and some nutrients removed from the grain during processing. Examples include processed white-flour products—bread, bagels and many crackers and cereals. Essentially, refined carbs can refer to just about any carb-based foods broken down from their natural state—arguably, that might even include making apples into apple juice. Keeping a good balance of carbohydrates in the diet is essential for grownups but even more important for kids. 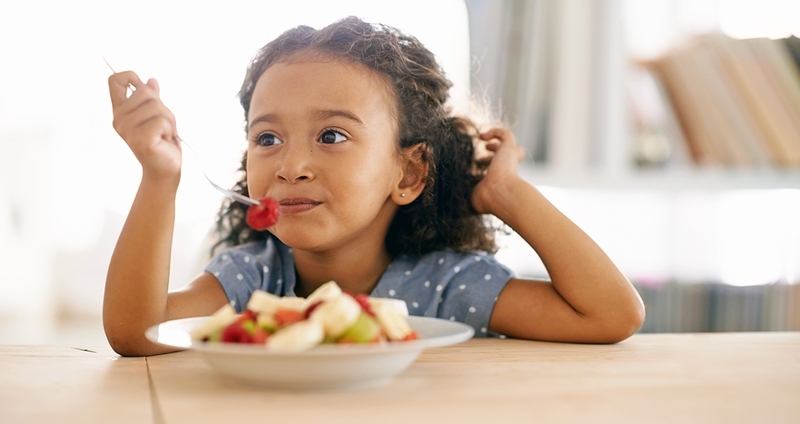 Children are generally more active and have higher metabolisms than adults, which means they require a greater supply of the easily accessible fuel that carbohydrates provide. Not to mention that their bodies are growing—a process that requires a constant supply of nutrients. Restricting an entire category of foods like carbohydrates can greatly compromise a child’s energy level and even mental acuity. When you consider that the brain needs glucose to function properly, it makes sense that without a ready supply, kids will have a harder time staying alert. In order to grow, play and learn, your kids’ bodies need healthy carbohydrates. Teaching your children how to make wise dietary choices rather than to fear certain foods will leave them healthy, energetic and empowered. So, when they become adults, they may not need diets at all.